On April 14th, 2018, a cycling expedition organised by the Russian geographical society began its course from a drifting ice station near Camp Barneo. Alpari is proud to be the general sponsor of this ambitious global project. 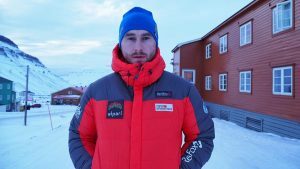 Attendees of the expedition, led by the famous Russian traveler Bogdan Bulychev, will ride their bikes in 22 days – for more than 220km – on the ice of the Arctic Ocean. Riding through these extreme conditions, the travelers have a mission to set two world records, and raise the Russian tricolor and Alpari flag over the North Pole. With our participation in this project we want to showcase that every challenge should be taken with a bold attitude; never giving up on your goal, looking for out-of-the-box solutions and emerging victorious against all odds. I am confident that the “Alpari Cycling Expedition to the North Pole” will strengthen the authority of Russian travelers around the world, as well as expand Alpari’s global presence. I will be monitoring the expedition closely, and I wish all the attendees good luck and courage in their journey.